Philippe Hurel studied composition at the ‘Conservatoire Nationale Superieure de Musique’ in Paris with Ivo Malec and Betsy Jolas, and with Tristan Murail. He conducted artistic research at the Institut de Recherche et Coordination Acoustique/Musique’ (Ircam) between 1985 and 1986 and between 1988 and 1989. In 1990 he started the ensemble Court-circuit together with Pierre-André Valade (2). 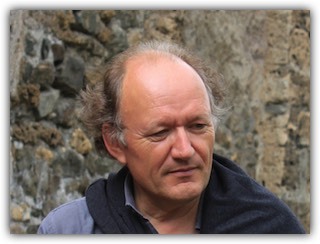 The music of Philippe Hurel is often called ambiguous because of his on-going endeavour to combine spectral music with classical techniques (3). Hurel himself calls it ‘Gérer l’Héterogène’ (4). He often takes timbre as a starting point for a composition - the spectral idea - but then integrates elements of counterpoint, polyphony and structuralism. The originality of the music lies in the synthesis that results from these influences: “l’originalité tient a la façon particulière dont un compositeur traite de concepts qui sont développés par des groupes” (5). Spectral music is based on the perception of listening. It’s main characteristic is continuous transformation which excludes any idea of repetition. After discovering spectral music through compositions by Gérard Grisey and Tristan Murail, Hurel began to write in a strictly spectral style. But his interest in polyphony and counterpoint - both strongly leaning on repetition - force him to find a common factor between both (6). The combination of both spectral and classical elements results in an ambiguous layer of perception in his music. The organization of the musical objects undergo a continuous transformation, according to the spectral concept. Each subsection within this large structure however holds the possibility of variation. This variation isn’t to be regarded in a strict sense as variations on a theme, but as a reference to an earlier musical situation (7). Thus the music doesn’t contain literal repetitions, but counterpoint is present within an ensemble of musical textures. As such, the music imprints on the musical memory of the listener, who is expected to listen actively for on the one hand an evolution of timbre and on the other hand a contrapuntal structure (8). Hurel applies what he calls ‘patterns’ to create this musical material. This idea is influenced by fractal mathematics. A pattern is a musical object with a recursive character: in it’s construction it contains an enlargement of itself. By accentuating specific parts, this enlargement is highlighted and creates a polyphonic construction. A pattern not only constructs a melody, but can be a general structural principle that influences all musical parameters. The processes that are driving the music form the basis of Hurel’s compositions. Other characteristics of Hurel’s works are an active harmonic pace and a clear structure, and the use of micro-tonality to enlarge the harmonic spectrum. As music is a succession of tension and release, it needs to be transparent to clarify its evolution. This revelation of the structural organization to the listener is of great importance to Hurel (9).